I have been following the latest blogging flame wars from my current travels abroad. It has afforded me an interesting perch from which to observe the current state of affairs in the insider-world of blogging. As usual Anil has hit the nail on the head as he referred to posts that Mena wrote a while back on the very subject of "blogger civility". It is hard to watch something you love get corrupted and for someone as talented as Kathy to be physically threatened. Geez - she is one of the truly unique voices who advocates for the people using the tools. Plenty has already been written and reflected upon. So, I will simply add that the onus is on all of us who love this great new landscape of social media to take the high road, police ourselves and insure that those who were not hugged enough as children do no get a platform from which to threaten and bully. Nice to see that maybe, just maybe the Valley tech geeks (whom I love and have been adopted by as "half-geek") are starting to realize that people who "don't get it", actually may not get it, because they really don't see a need for some of the stuff that is coming out of "web 2.0" land at the moment. There is an entire universe of people who still don't know what a blog, myspace, youtube or flickr are, let alone digg or delicious. Maybe these companies are not doing a good enough job COMMUNICATING the VALUE of what is being created or-big gulp-they have nothing of inherent value to a potential customer base. What is exciting to me about today's tech stuff is that much of it is focused on making it easier than ever for non-geeks to express and create and build cool stuff. I want even more tools. But I want em even easier to use. I want to be able to 'drag and drop' and 'mash' and 'smash' stuff together without asking for help from my developer buddies or spending an entire weekend learning code (or Ruby). I don't want to have to learn CSS (yes, I know it is awesome and easy, but not easy enough). I want tools that work as easily as scissors and pens and paint and I want to be able to find other people or businesses with like minded scissors and pens and paint. That may not be enough to sustain a lot of large businesses, but it sure would put the tools directly in the hands of the creators and make it really interesting to see what gets "pasted together". 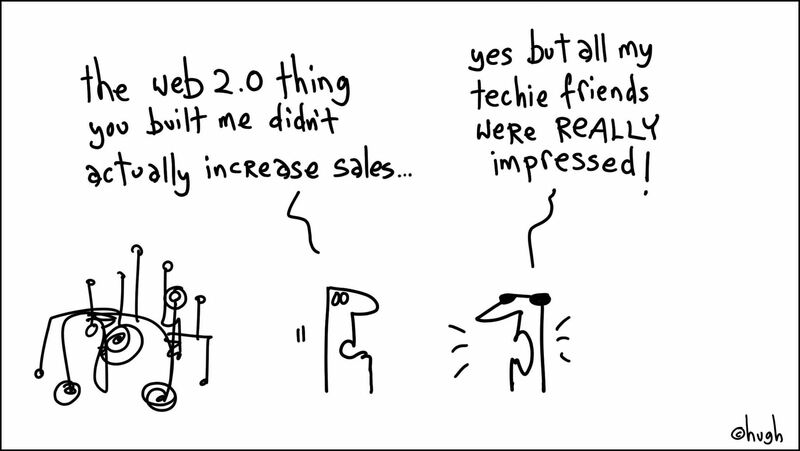 As for the Web 2.0 madness, yes, there are a lot of tools and products masquerading as companies. Nothing inherently wrong with that (as long as they don't all expect to be the next Google) or are creating something of value that they believe in and are (perish the thought) having fun while they do it! It is still intriguing to me, even after almost two years of living in the Valley, that there is often a (faux) expectation of 'purity of vision' demanded of companies here that does not even cross the mind of many entrepreneurs on the "other coast". But I will leave that topic for another post. OK - I am not actually sure where the above rant came from, but I think I got it all out of my system now. move along. It's deja vu all over again - hype and more hype (we have not yet reached hype, hype and more hype, stay tuned). Which got me thinking that it might be time for a trip down memory lane. So for some real fun, I suggest you start in 1997 with headlines including; "The Digital Frontier", "Internet Communites","Webcasting" and "How long can it last", then click on over to 1998 for "Zap! How the year 2000 Bug will Hurt the Economy", "Doing Business in the Internet Age", and "How Worried Should You Be? followed by 1999, which includes, "High Tech's Hot Hand", "E-Business, What Every CEO Should Know? Scandal on Wall Street" and "Is Greed Good?". FInally, make sure to revisit 2000 and the AOL/Time Warner merger deal, "The New Economy" and The Wall Street Hype Machine. I just couldn't let this one pass...Om Malik reports that over at SimplyHired you can now search to find a dog friendly employer. As someone who has been basking in the shadowy aura of techno geeks for the last ten years and spending much of my life as a "translator" between gearheads and business people, I consider myself relatively well versed in certain aspects of certain areas of technology. Alas--someone non-techie has to communicate DNS mapping and other overly complex web-based URL association to the general public in *english*. --aha it's really a techie conspiracy to rule the world forever.